In the “Language of Flowers,” the orchid symbolizes fertility and wealth. They are exotic and valuable… so we chose the perfect name for our Summer Orchid. ***UPDATE*** FLORA IS CONFIRMED PREGNANT BY RED GRANITE'S INNSBRUCK, 6x COLOR CHAMPION/3x RCC & CABA JUDGE'S, CHOICE MALE!!! We are WOWED by Innsbruck's histograms, his fleece and walking fleece scores consistently in the 80's, scores that usually are only seen with high quality whites. His EPD'S put him in the Top 10% in both SDAFD and %M and the Top 25% in SF. 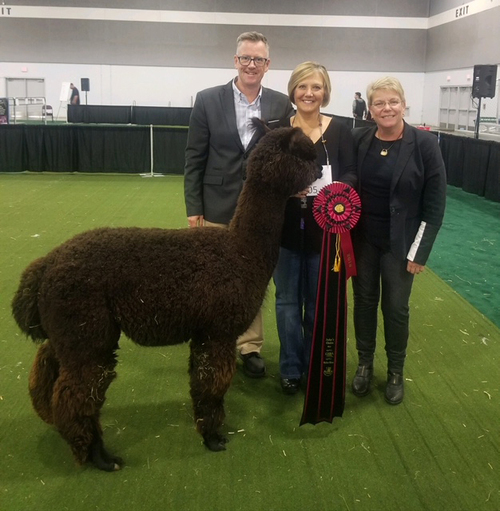 AND, he was awarded Judge's Choice Halter at 2018 CABA. Who was judging black males? 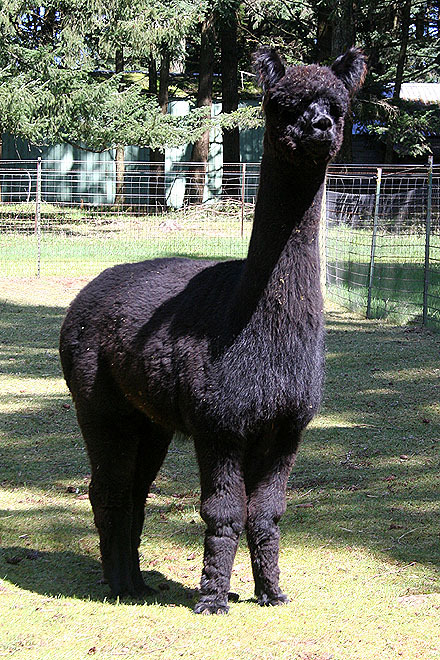 None other than renowned breeder of black alpacas, Picky Peter Kennedy! We feel that the combination of genetics offered in this pairing will result in a superb cria, with every good possibility of a true black. Flora's first cria, Gilly Flower, is a lovely spotless black female, sired by TB, CC Patagonia's Baccus, so we're betting her sibling will also be black. Flora is a flashy young matron with a beautiful head. She has wonderful conformation, super bone, and an upright, proud demeanor. This elegant young female's, genetics combine many of the most well respected names in the "Grey Stud Book:" Rincon Cloud, Danko, Rayo del Sol, Lanark's Silver Charm ... and she does them all proud! The grey world sadly lost Silver Charm, Flora's maternal grandsire in 2012. 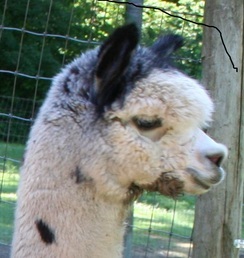 His last cria was born that year. Flora is one of his last granddaughters. 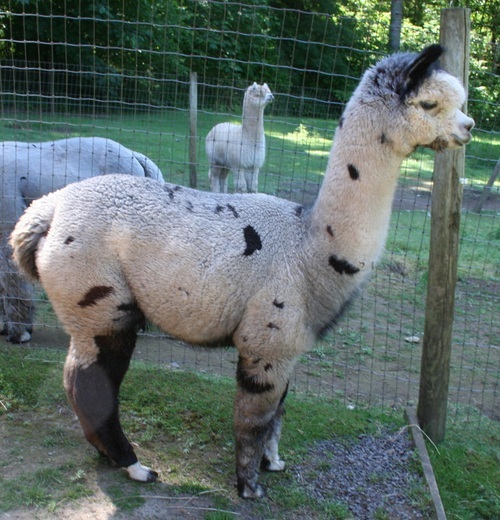 Danko, her maternal grand sire, is also deceased. 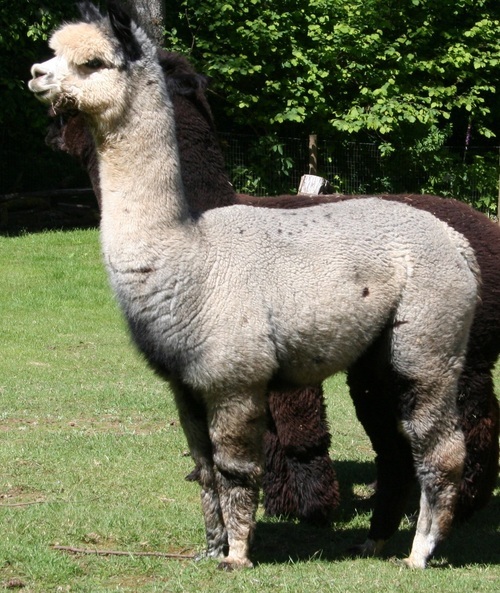 Danko was Alpacas de la Patagonia's "go to" herd sire. They called him "The Man" and he sired their now almost legendary, Lennox. Sad as they are, these losses add value to Flora's strong grey pedigree. Flora's sire, Emerald Farm's Rincon Cloud, is a Multi-Champion, including 2005 AOBA Nationals. His genetics are at the foundation of many outstanding grey herds. Flora's dam, LF del A Summer Orchid, and her grand sire, Silver Charm, retained their fineness histogram after histogram. Flora's following right along. Her first histogram came back with an AFD of 18.9 and CF of 98.1%. Her second histogram, at 23 months, came back with an AFD of 21.1 and a CF of 94.8 (take a look at the full numbers at the top of this page). Her beautiful, low amplitude crimp is reminiscent of Rincon's and it has great density. Her blindingly bright first fleece sold for a high price at a fiber festival in 2015... bringing comments of "OOOOH, so soft!" And, right they were. She did it again in 2016. Her second fleece sold to a delighted hand spinner for top dollar. And, in 2017, her fleece was spun into bulky yarn. It's all gone! Anything better in a foundation female, than a proven young matron, with a huge grey pedigree, and highly marketable fleece, bred to a stunning black Judge's Choice male AND at a reasonable price?